Muscletech Anarchy – How potent is it? Muscletech’s Anarchy is a pre-workout supplement and the brand’s most recent addition to their Performance Series. MuscleTech is known for producing well-known supplements such as Clear Muscle and Hydroxycut. In the recent years, MuscleTech has gained quite a reputation for always falling short of their customers’ expectations. 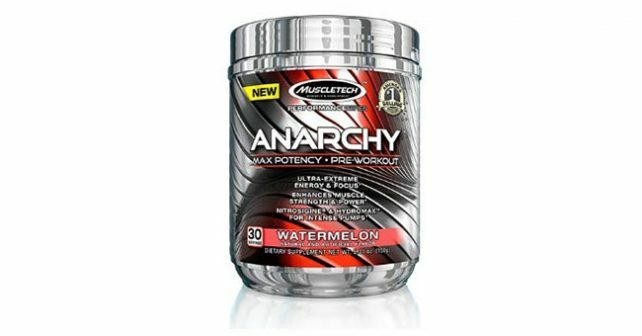 It’s quite expected that with the earlier overhyped product releases that nobody expects much from MuscleTech’s Anarchy. MuscleTech’s Anarchy is the first pre-workout supplement in the Performance series. The pre-workout supplement industry is one of the most competitive markets today. Will Anarchy be MuscleTech’s saving grace? We took a closer look at MuscleTech’s Anarchy to see if the product has all the markings of a successful pre-workout supplement. MuscleTech boasts a more concentrated dose of its key ingredients for Anarchy. Anarchy is predominantly made up of ergogenics. Ergogenics are substances that are made for endurance, performance, and recovery. As with most products that contain Caffeine Anhydrous, the caffeine effects kick in about 30 minutes after taking MuscleTech Anarchy. It has a fairly regular dose of Caffeine Anhydrous, at about 190mg per serving, which is about equal to the caffeine content of three cups of coffee. Users who are caffeine sensitive would need to take caution and ask a physician first before taking MuscleTech Anarchy. Anarchy contains vasodilators, which ease up the blood flow going to your extremities and muscles. Anarchy users have also reported an effect that creates aggression. This is great if the aggression is focused on working out, but for some people it may be off-putting. One of the best things about MuscleTech is that they always adhere to a transparent disclosure of all of their ingredients. This makes it easier to assess the ingredients and come up with a decision whether to buy their products or not. It’s quite noticeable that the mix did not contain any kind of protein to assist in building muscles. It would have been a great combination of focus, energy, and muscle nutrients to deliver the best results at half the time and effort. It’s disappointing to see a fundamental nutrient combination being split into two different products just so the business can thrive. That’s just the case with MuscleTech. It would have been a fantastic combination if Anarchy was combined with the effects of Phase 8. If you need a complete supplement for intense workouts, checkout NitroGenix 365, and for added effects, see the benefits of using NitroGenix 365 with Xtreme Testosterone.